Showing Products 1 to 21 of 49 Products. The new Botswana book from bestselling author Alexander McCall Smith, this is Mma Ramotswe's sixteenth wonderful adventure. The first of a brand-new series of adventure books from the creator of the No. 1 Ladies' Detective Agency sales of over 20 million copies worldwide. The first in a new series of books by the author of THE NO. 1 LADIES' DETECTIVE AGENCY - marking new territory - but familiar moral ground. The new Botswana book from bestselling author Alexander McCall Smith, this is Mma Ramotswe's fifteenth wonderful adventure. A beautiful, heartwarming story set in Africa about a young boy and his yearning for a pet dog. From internationally bestselling author Alexander McCall Smith. High quality cream paper and a special easy-to-read font ensure a smooth read for all. 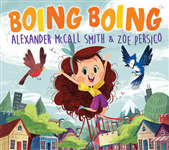 National treasure Alexander McCall Smith joins up-and-coming illustrator Zoe Persico in this utterly adorable story of family, acceptance and difference. Part of Barrington Stoke's picture book range for all the family, with easy-read font. * Highly original 'detective' stories with unique setting and characters featuring Mma Ramotswe and her No.1 Ladies' Detective Agency. We catch up with the latest delightful goings-on in the fictitious 44 Scotland Street from Alexander McCall Smith. The tenth wonderful story in Alexander McCall Smith's much-loved Isabel Dalhousie series. The first of two hilarious detective mysteries starring Max and Maddy Twist.